Structured Data – Part I – What is Structured Data? If you work in SEO or on websites for a living chances are you are fully aware of structured data. If you do not work in the industry however, you probably have ZERO idea what structured data is, what it does, or why it is so important. That is totally fine – we are here to explain exactly what it is and why you should care! This is the first part of a series of articles that will explain what structured data is, the different types of structured data, why it is important, and some common uses. Data can be formatted to tell Google and other search engines exactly what each piece of information is. For example if we were using the Local business markup we would format it to include the business name, logo, address, phone number, email, social media accounts, exact Geo-location (latitude & longitude), and business hours. Once your data is structured it is easily accessible for search engines to crawl and extract any information they may need. 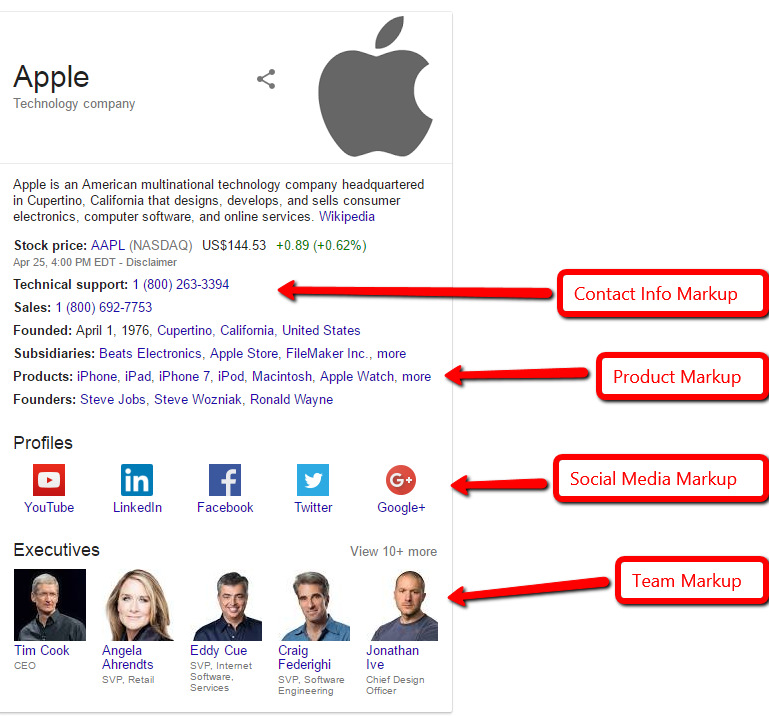 Although there are many styles of structured data there is two dominant markup formats – Microdata & JSON-LD. JSON-LD is the industry standard that has been recommended by search engines such as Google, however, in certain instances Microdata could be more appropriate. 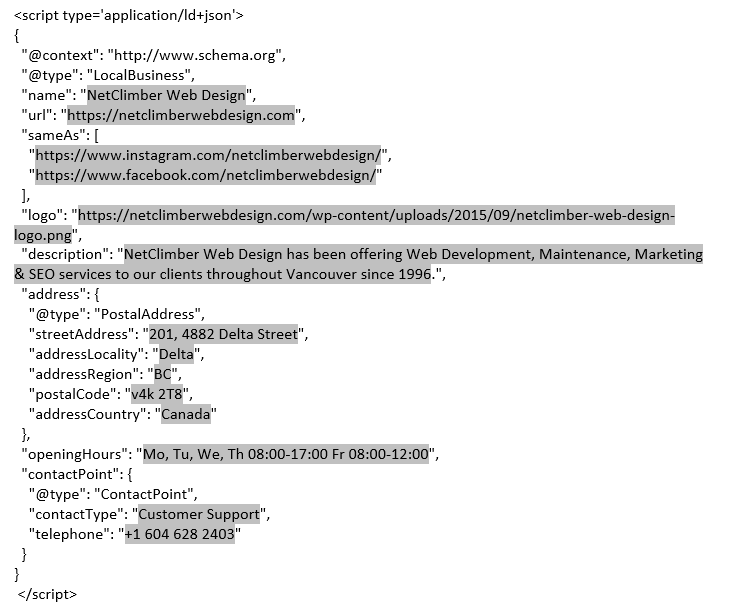 For example below is a local business markup using Microdata for a NetClimber Web Design. 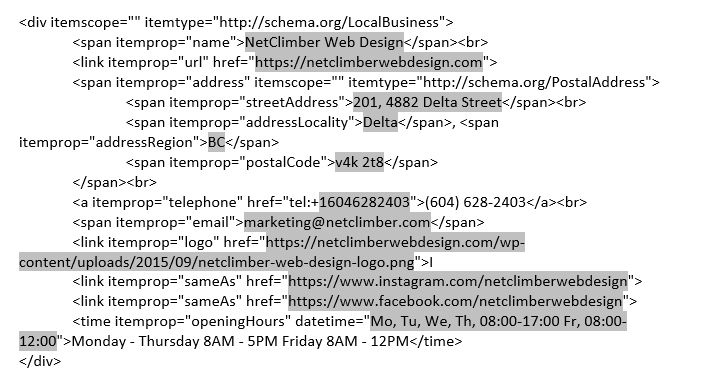 For example below is a local business markup using JSON-LD for a NetClimber Web Design. By structuring the data in these ways you clearly classify what each data point is. Now Google can associate those social media profiles, phone number, email, business hours with your business. Once they understand all the aspect of your business they may include certain aspects in your Google My Business page such as links to your social profiles, or email links. A great example of this can be seen below on Apples Google My Business page. With all the information Google is then able to display your website creatively – using Rich Snippets. For example if you have reviews on your website you can mark them up so they are eligible to display the star rating, total number of reviews, or even the name and location of the person reviewing you. This has to potential to greatly increase your visibility on the results page. Rich Snippets are any type of extensions to the regular search results. This includes things such as text, breadcrumbs and ratings stars. If you markup your event it could even show up directly in the search results under your website. Here the company eventful.com has marked up the upcoming concerts so they are able to show up in the search results. This will draw people’s eyes, attention, and hopefully clicks. Structured data has the ability to increase your presence on the search results significantly and can drive hundreds or thousands of clicks to your website each month. In our next articles we will discussing Product Schema Markup, Markup for E-commerce Businesses, and Rich Results. If you are looking to add structured data to your site Contact Us to find out more!